The Suppakids Sneaker Boutique in Stuttgart, Germany is home to a fine collection of kids footwear for boys and girls from baby to pre-teenagers.The unique display arrangement was designed by the Swiss architeture firm ROK. 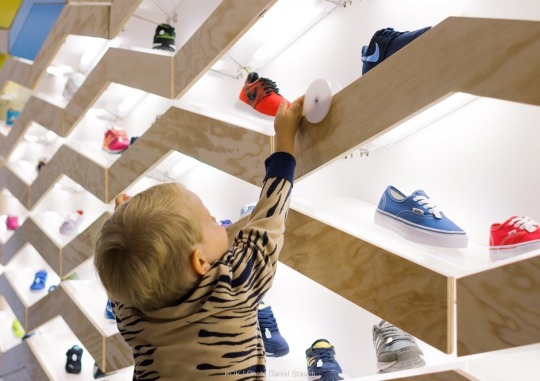 The unique arrangement invites kids to play with a subtly integrated cascading disk run while browsing through the shoes on the setup. Similar to a marble run the edge of the display shelving serves as a guide for several colored wooden disks to play with. The backlit elements are made from natural and painted pinewood creating a warm and inviting interior. Suppakids also has an online store!